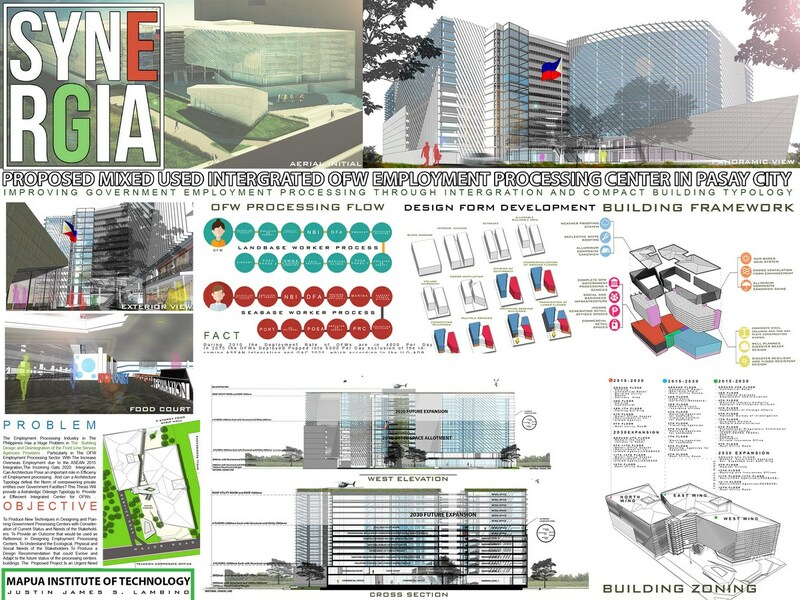 Synergia A Proposed Mixed-Use Integrated Overseas Employment Processing Center is located at Mall of Asia Complex, Manila Bay, Pasay City Philippines. It is a Project for the Philippine Overseas Employment Administration that will cater the employment needs of Overseas Filipino Workers. With the Current globalization of the Labor Industry in the Country, and the Incoming ASEAN Integration, the Asia Development Bank- International Labor Organization (ADB-ILO) expected that the labor migration of Filipinos will increase in the next decades by 12 % annually. The Proposes Project will integrate Government concern agencies and Departments, Private Recruitment Companies, Private Banks and Insurance Companies, and other Private Overseas Filipino Workers (OFW) Related businesses. 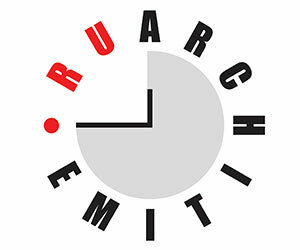 SYNERGIA: The Idea of the Building typology comes from the word SYNERGIA which is a Greek word that means, “when ideas are done together you create a more effective result” The Designer introduces Mixed use building typology for Overseas Employment Industry which has a huge problem in the current Employment Processing. Agencies and Departments that are concern with Overseas Employment Are Scattered all over Metro Manila, which reduces efficiency and effectivity of the Employees and the Overseas Applicants. Therefore, the project will improve the current tangled employment processing industry and reduce the unnecessary resources wasted in employment processing. 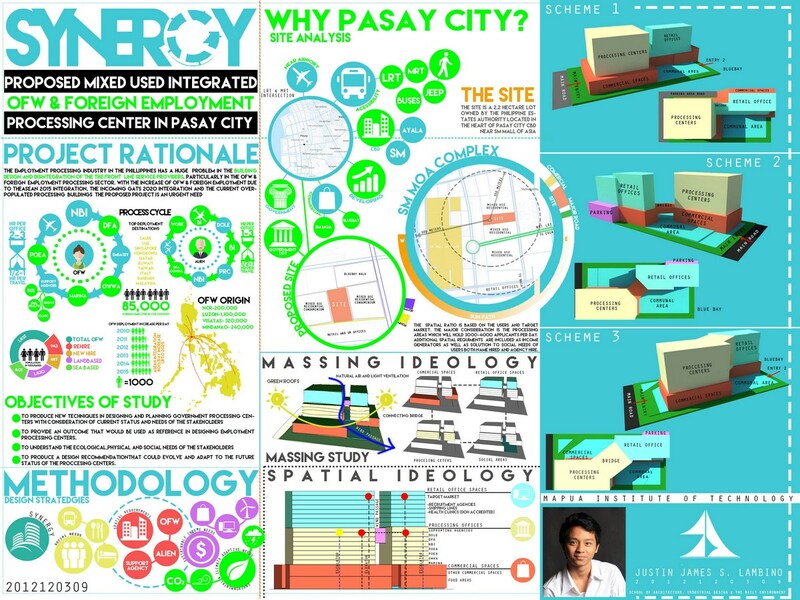 SITE ANALYSIS: The Project is situated in Pasay City, which is in the center of Metro Manila. Pasay city is a growing business district that has the capability to house the proposed project based on its economic, social, political and environmental conditions. The location of the site is near mixed used commercial, Office and residential buildings, Government concerned Offices, and Transportation Terminals such as Ninoy Aquino International Airport, Manila Harbor and the Philippine Railways systems. Among other Cities in the Metro Manila, Pasay City Business District has the most potential to accommodate the Proposed building, it is not only accessible but also has the ability to serve the needs in the industry of Overseas Employment. THE DESIGN: The Designer went to a thorough process of behavioral and user analysis. Since the project concerns different Agencies and Departments concerned with OFW processing industry, the design was able to follow the behavior of applicant and the step by step procedure per Agency or Department Concerned. The placement of Different Agencies and Department is based on the current population of applicants per Agency / Department, it also inherits the step by step procedure of the processing. The Design was planned in a way the Government and the Private Entities could have the most economic and efficient location and sizes for their needs and the needs of their applicants. All of the Living spaces such as Offices, waiting areas, etc. 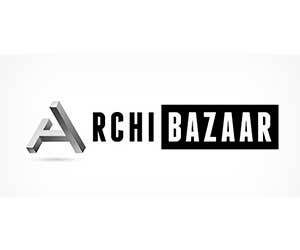 have the access to a seaside and business district view of the area, which also improves the efficiency and effectivity of work of the government and private employees and the comfortability level of the applicants. 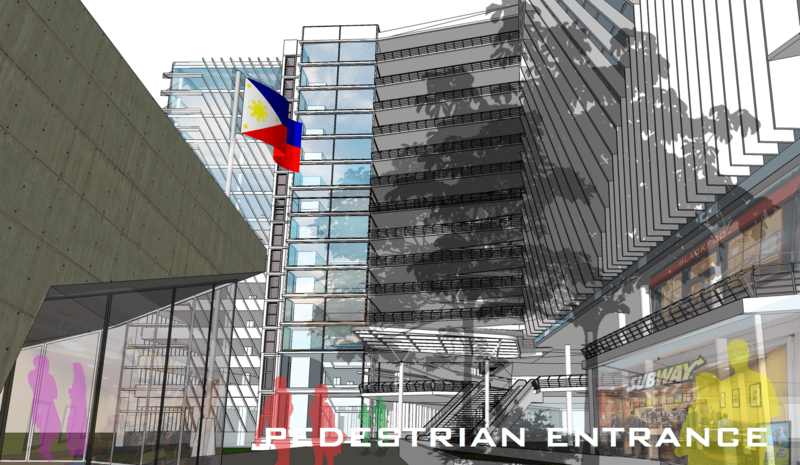 BUILDING TYPOLOGY: The Building composed of different Government and Private agencies and Establishments that will cater all the needs of the Overseas Workers from Pre-Employment to Departure. There are 2 Towers which are being connected by a Sky Bridge. Tower A (Right Side) is the primary Building which consist all the needs of the applicants from training to documentation. The Tower B (Left Side) is mainly a Parking Building which has Leased Office spaces on the top to cater private business demands of the Overseas Employment Industry. 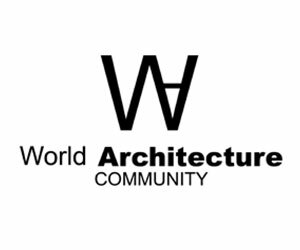 ENVIRONMENTAL DESIGN: The Designer also aims to provide a Building Design that will reduce energy consumption and improve the health of the users. The Roof of the Building is a Reflective White Aluminum composite roofing system that reduces heat gain during hot days and also avoid oxidation from sea breezes. 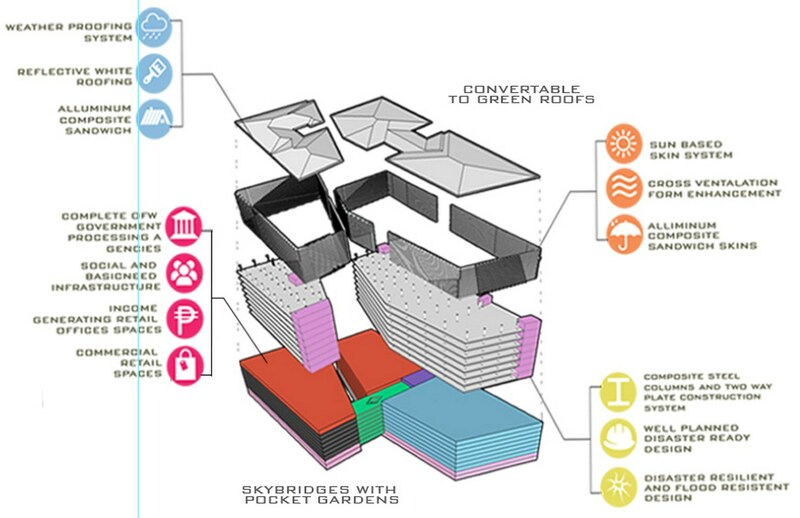 It is also convertible to Green Roofing system to reduce urban heat island effect when the area becomes dense and populated. Building Envelope is enclosed with double glazed glass curtain wall and surrounded by Sun path based louver skin system which follows the Sun Path in order to reduce direct heat gain in the Building. 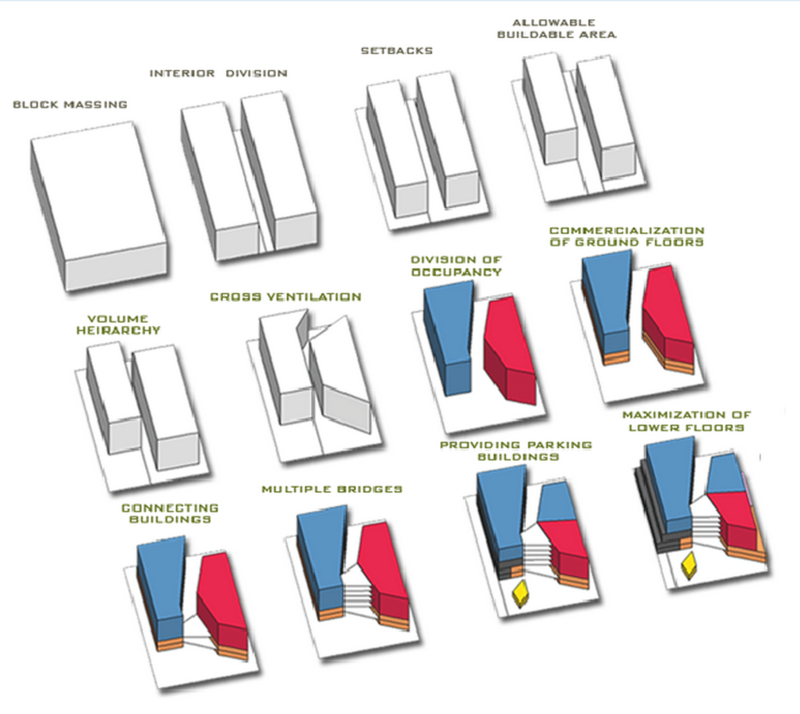 The Form of the building is also based on the wind path analysis of the site, it is form in such way that the prevailing winds could enter the site so that it could lessen the use of air-conditioning and improve comfortability level of the Users. Justin James S. Lambino is currently a graduating B.S Architecture student at Mapua Institute of Technology-Manila. During his undergraduate studies he took a specialization in Urban design and produced competitive design strategies and solutions for the current problems in Metro Manila. One of which is their project in Divisoria, Manila which improves the current conditions of Flee Market in Manila by providing Pedestrian focused design scheme. He is also a Green and Sustainable Advocate that hopes to provide healthier and more interactive environment for his clients. He is planning to pursue Master’s program on Environmental Psychology, Materials Engineering and Real Estate Economics. He has high hopes that he will achieve this through hard work, dedication and love for the humanity and environment.